Description: The transition from studying calculus in schools to studying mathematical analysis at university is notoriously difficult. 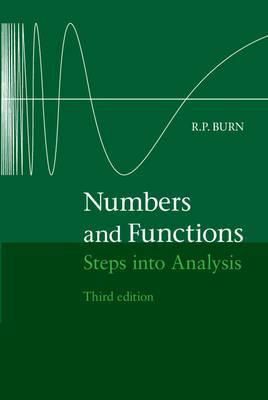 In this third edition of Numbers and Functions, Professor Burn invites the student reader to tackle each of the key concepts in turn, progressing from experience through a structured sequence of more than 800 problems to concepts, definitions and proofs of classical real analysis. The sequence of problems, of which most are supplied with brief answers, draws students into constructing definitions and theorems for themselves. This natural development is informed and complemented by historical insight. Carefully corrected and updated throughout, this new edition also includes extra questions on integration and an introduction to convergence. The novel approach to rigorous analysis offered here is designed to enable students to grow in confidence and skill and thus overcome the traditional difficulties.